We can reach every point in the world but, more importantly, we can be reached from any point in the world. Privacy and its possibilities are abolished. Attention is under siege everywhere. Not silence but uninterrupted noise, not the red desert, but a cognitive space overcharged with nervous incentives to act: this is the alienation of our times...--from The Soul at WorkCapital has managed to overcome the dualism of body and soul by establishing a workforce in which everything we mean by the Soul--language, creativity, affects--is mobilized for its own benefit. Industrial production put to work bodies, muscles, and arms. Now, in the sphere of digital technology and cyberculture, exploitation involves the mind, language, and emotions in order to generate value--while our bodies disappear in front of our computer screens.In this, his newest book, Franco "Bifo" Berardi--key member of the Italian Autonomist movement and a close associate of Flix Guattari--addresses these new forms of estrangement. In the philosophical landscape of the 1960s and 1970s, the Hegelian concept of alienation was used to define the harnessing of subjectivity. The estrangement of workers from their labor, the feeling of alienation they experienced, and their refusal to submit to it became the bases for a human community that remained autonomous from capital. But today a new condition of alienation has taken root in which workers commonly and voluntarily work overtime, the population is tethered to cell phones and Blackberries, debt has become a postmodern form of slavery, and antidepressants are commonly used to meet the unending pressure of production. As a result, the conditions for community have run aground and new philosophical categories are needed. 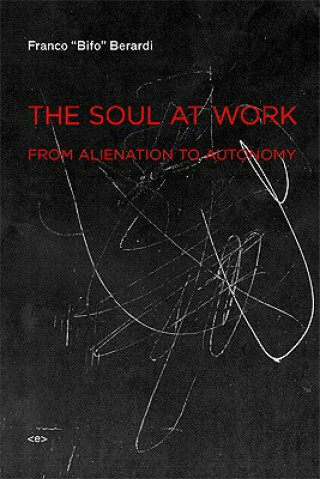 The Soul at Work is a clarion call for a new collective effort to reclaim happiness.The Soul at Work is Bifo's long overdue introduction to English-speaking readers. This Semiotext(e) edition is also the book's first appearance in any language.